Four new gantry cranes arrived yesterday evening at the HHLA Container Terminal Burchardkai. These state-of-the-art container gantry cranes are designed for the latest generation of mega-ships. Hamburger Hafen und Logistik AG (HHLA) is therefore laying the foundations for being able to handle ships carrying 18,000 standard containers (TEU) at its facilities. 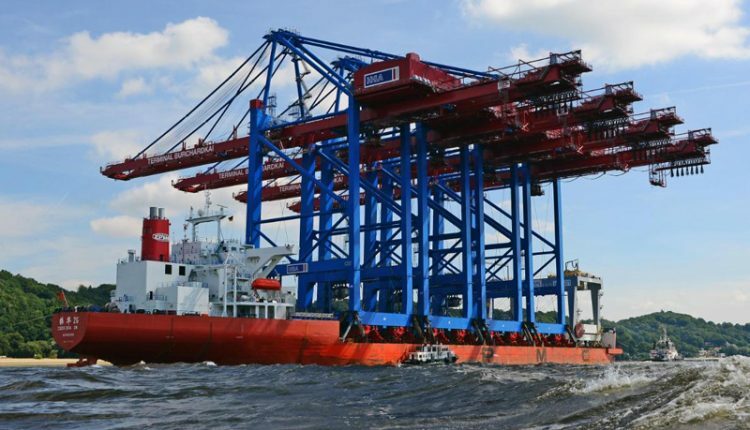 Following an eight-week voyage from Shanghai to Hamburg, four state-of-the-art container gantry cranes arrived on August 8th at the Container Terminal Burchardkai (CTB). The new container handling equipment will be used at the Waltershof port, together with a fifth gantry crane which will depart Shanghai for Hamburg in the autumn. CTB staff thoroughly tested the container gantry cranes produced in the vicinity of Shanghai before accepting them from the global market leader, ZPMC. They will go into operation consecutively over the next few months. The launch of the newly delivered cranes will mark the completion of the quayside expansion programme at the CTB’s Waltershof port. With its 1.4-km quay, the Waltershof port will now have four mega-ship berths, with a total of 15 gantry cranes. ZPMC’s new gantry cranes are designed for container ships with 24 transverse container rows. Thanks to their 74-metre jibs, they are very well equipped to handle the first 18,000-TEU ships with their 23 container rows, which have just gone into service. The cranes have also been optimised in terms of the height of the jib. They can handle nine containers on top of one another on deck. The new cranes can also operate in tandem mode. One hub makes it possible to move two 40-foot containers or four 20-foot containers. Each gantry crane weighs 2,400 tonnes and can handle a maximum payload of 110 tonnes. The gantry cranes were transported on a converted tanker. This ship – which was originally designed for a load of 80,000 tonnes – had no trouble handling the cranes’ total load of around 10,000 tonnes. Over the past few years, ZPMC has become the global market leader, not least because this Chinese company offers its customers the possibility of accepting their equipment at the production site near to Shanghai and for its subsequent transportation to the site of operation, where the final handover takes place.